If you have asked some people about the best pair of desktop speakers to deliver enhanced audio performance from a PC, there is a huge chance that you received suggestions to get Audioengine A2. Of course, Audioengine A2 is an excellent pair of premium desktop speakers. The product is loved very much by the users due to the top-notch performance. With a pair of truly reliable speakers, you can have immersive audio experience as you stream film or music or play a game. However, once you look for Audioengine A2 on the Internet, there is also another model, namely Audioengine A2+. Between these two products, Audioengine A2+ is slightly more expensive than Audioengine A2. So, which is the one you should choose? Each of the two products consists of a pair of speakers that act as Left and Right stereo channels. Both products are very rugged and durable. They each features a very sturdy hand-built housing that protects the internal components. They feature a satin finish that provides all-time elegance. The woofers are made of Kevlar, promoting not only total durability but also superb low-end notes. The construction delivers low-frequency sounds with such accuracy and precision. Meanwhile, the tweeters are constructed of silk for smooth and accurate highs. Both models have the auto-sleep for power saving. As you can see, Audioengine A2 and Audioengine A2+ are designed in pretty much the same way. However, Audioengine A2 is only available in the black color. 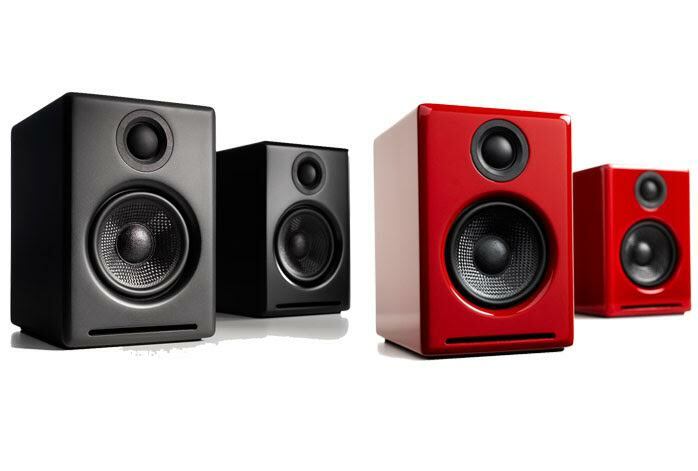 Audioengine A2+, on the other hand, is available in three color variants: black, white, and red. Audioengine A2+ also comes with more connectivity options than Audioengine A2. The older model, Audioengine A2, only has two RCA input jacks, while the other connectivity ports are for connecting the right and left speakers. On the other hand, the newer Audioengine A2+ offers more flexibility and versatility. It provides input and output RCA jacks, allowing you to connect more speakers or headphones. The variable audio output allows you to connect a subwoofer or a wireless adapter. The most substantial improvement that Audioengine A2+ brings is that the model comes with built-in DAC with USB port. The built-in DAC allows you to send high-quality digital audio signals directly from a PC to the speakers via the USB port. Thereby, the output quality is enhanced significantly. If you can benefit from the added USB port, you can choose Audioengine A2+. Audioengine A2+ is also the way to go if you want to connect a subwoofer or a wireless adapter. Otherwise, you can go with Audioengine A2 for the fullest value out of the money.